Here we go again with another round of jaw-dropping, show-boating, merrymaking entertainment! I’m so excited about this months show adventure and I thought I’d share it with you. It’s February with Valentine’s day in tow! Who doesn’t love their fill of “Hallmark Holidays” with plenty of fabulous presents for your loved ones and friends? Why not throw a little flirtatious satire into your holiday enjoyment. Last months Masquerade Ball was such a glamorous revelry, and this month it’s a Valentine’s Day show so we have even more entertainment lined up! Teamed up with the Nevada Theatre we are bringing a variety show called Monday Cabaret. This month’s theme is “Be My Valentine’s Sweetheart”. 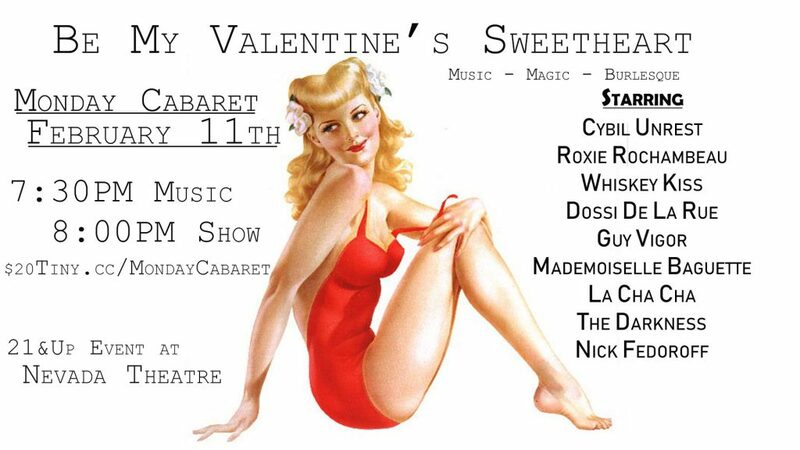 There will be music, magic, dancing girls, and performers from The Vixen Dames sister troupe! If you are interested in live stage shows and amazing entertainment please join us on Monday Feb 11th at the Nevada Theatre for the fifth of our monthly Monday Cabaret series.